Recruits learn, from day one, that to be a Marine means doing what is right in the face of overwhelming adversity. To understand how to do what is right, recruits and Marines are taught about ethics and the core values of the Marine Corps. The Corps' core values are Honor, Courage, and Commitment. 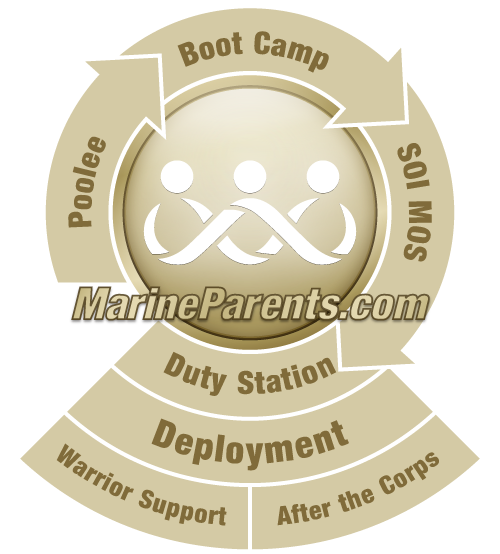 These values make up the bedrock of a Marine's character. During recruit training, recruits are taught these core values and numerous others related to them, such as integrity, discipline, teamwork, duty, and "esprit de corps." Honor- the base of a Marine's character. It is the quality that empowers Marines to exemplify the ultimate in ethical and moral behavior: to never lie, cheat, or steal; to abide by an uncompromising code of integrity; to respect human dignity; and to have respect and concern for each other. It represents the maturity, dedication, trust, and dependability that commit Marines to act responsibly, be accountable for their actions, fulfill their obligations, and hold others accountable for their actions. Courage- the heart of a Marine's Core Values, courage is the mental, moral, and physical strength ingrained in Marines that sees them through the challenges of combat and the mastery of fear, and to do what is right, to adhere to a higher standard of personal conduct, to lead by example, and to make tough decisions under stress and pressure. It is the inner strength that enables a Marine to take that extra step. Commitment- this is the spirit of determination and dedication within members of a force of arms that leads to professionalism and mastery of the art of war. It promotes the highest order of discipline for unit and self and is the ingredient that instills dedication to Corps and country 24 hours a day, pride, concern for others, and an unrelenting determination to achieve a standard of excellence in every endeavor. Commitment is the value that establishes the Marine as the warrior and citizen others strive to emulate. Above information taken directly from marines.mil. Marines of Support Battalion make their way back to the finish line during the log race at Marine Corps Recruit Depot San Diego, Januar 21, 2015. Throughout the course, one could hear each team of Marines motivating each other to keep pushing. —USMC Photo by Sgt. Benjamin E. Woodle.